Designed as a positive locking jack for irregular clamping to achieve various heights requiring a positive pressure stop. 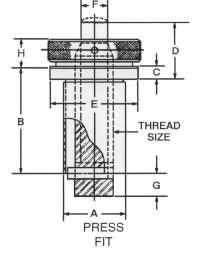 Adjustable to fit height irregularities of milling operations. Available in either a smooth radius head or a hardened tool steel serrated gripping surface. Elevates vertically, no rotation. Outer diameter of bushing ground for press-fit.